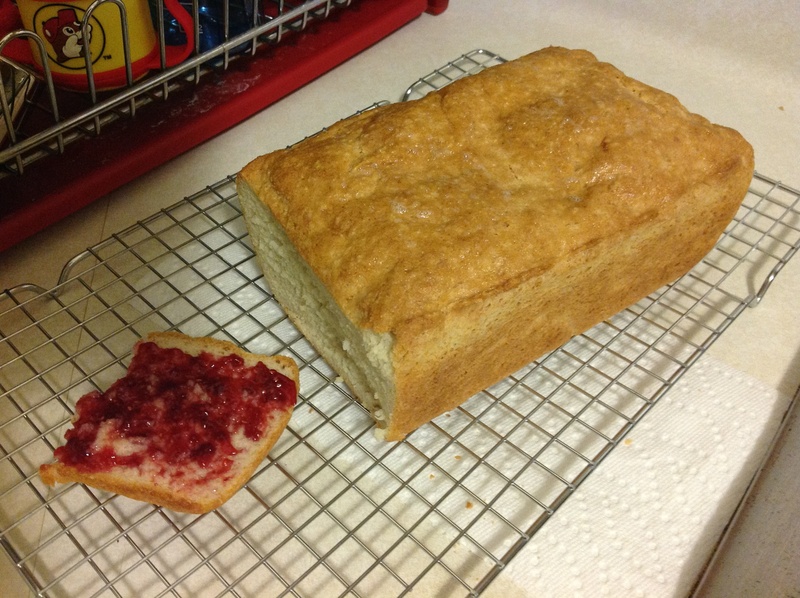 First Successful Gluten Free Loaf of Bread! First, I made a brown rice flour blend. You can find this blend on several websites online. It yields nine cups. I used the recipe at the website listed above and used my flour blend (2.5 cups). I didn’t have potato flour, so I made some by putting potato flakes in my blender. As I ate the bread, I kept thinking that I was eating white bread made from wheat flour. It was such a treat. I had to keep reminding myself that I wasn’t going to have any problems like I would from eating a loaf of wheat bread. The outer crust was crunchy hard and the inside was spongy soft. You could fold and squeeze the bread and it would spring back to its shape and not crumble. I will be making this recipe again. Next time, I will add honey to add more flavor and sweetness, as I thought it needed it. It did taste good with jam. I had three thick slices back to back. The website has a great video showing how to make the bread. The chef uses a hand mixer, but I attacked it by hand with a whisk. Interestingly, GF bread dough resembles thick cake batter, so the whisk works fine. Plus, you don’t have to kneed it on a floured surface. After mixing, you spread it in a baking pan, let it rise, and then bake it. There is no punching down, no huge mess. I’m going to slice what’s left and freeze it, pulling out slices as I need them. I’ll probably also make the raisin bread that’s listed on the site. *After freezing and pulling out a slice to toast it, the bread was a bit crumbly.